What is a Zorba portable computer? From its introduction in 1983, the Zorba Portable Computer reigned supreme as the trusted companion of professionals and students worldwide. Its instant success was due to innovation, quality and a well established base of loyal customers. The Zorba became the object of fascination to a vast following of dedicated enthusiasts which sprang up to explore its intricacies and possibilities. Even today, its classic design makes it a useful and collectible tool with yet a few surprises left. This site is dedicated to documenting and preserving this amazing machine. 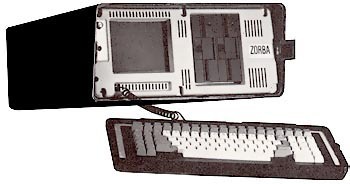 The Zorba was one of the last 8 bit portable computers running the CP/M operating system. It's features were almost identical to the Kaypro II. Nevertheless Zorba users were very satisfied. They were able to read practically every existing CP/M floppy format. Its several video emulations (Heathkit 19/89, Zenith 19/89,DEC VT52) allowed them to run virtually any existing CP/M software. The Zorba Equipment Preservation Society (ZEPS) is dedicated to providing a hardware and software source for the Zorba. If you would like to depart with your Zorba, please consider donating it to ZEPS.